Dina and Arina Averina, who proved that they worth being the best in the Rhythmic Gymnastics world this year, each have a new title: Ambassadors of Elegance for Longines, a longtime FIG partner. 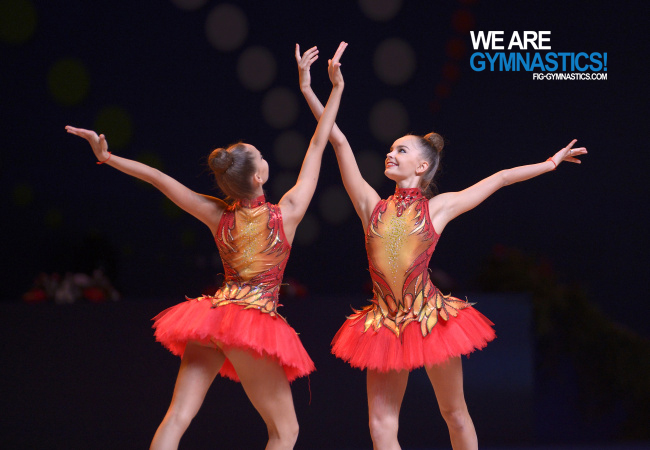 Between them, the Russian twins created a sensation by splitting the individual gold medals at their debut World Championships in September in Pesaro, Italy, with Dina winning the coveted All-around title in front of her sister. But it is their natural elegance, expressed on and off the Rhythmic floor that attracted the attention of the Swiss watchmaker. Longines’s slate of Ambassadors of Elegance also currently includes gymnasts Kohei Uchimura and Giulia Steingruber, both among the big names in the sport. Japan’s Uchimura is the two-time Olympic All-around champion and six-time World All-around champion, while Steingruber in 2016 became the first female gymnast to win an Olympic medal for Switzerland. Comfortable training clothes is important for every athlete. See our girls gym shorts. China impressed everyone at Suzuki World Cup 2016!